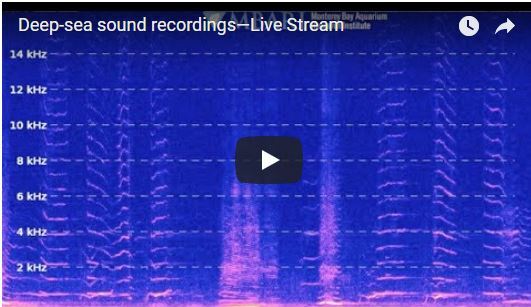 This live stream of the ocean soundscape is from 900 meters deep just outside Monterey Bay, California. Recordings come through a hydrophone on a deep-sea cabled observatory. Audio has been amplified so that you can hear it through your speakers, but you may still need to turn up your volume to hear the many subtle sounds. The very low pitch of some baleen whale vocalizations can only be heard with appropriate speakers (subwoofer or high-quality headphones). The stream is delayed approximately 30 minutes from the current time to allow for processing. Sound files are recorded in 10-minute segments, so every 10 minutes you will hear the beginning of a new sound file. Sound sources and levels vary greatly. Tuning in at any time, you may hear whales, dolphins, sea lions, boats, rain, wind, earthquakes, and other sounds. If the live stream is scrolling but extremely quiet (red line at bottom flat), that means there was a loud sound within a 10-minute segment. The automated processing muffles the entire segment to avoid sending a sudden loud noise through your sound system. You’ll hear the muffled loud sounds and see them in the scrolling spectrogram. If you tune in to a quiet soundscape, check back later. Meanwhile, you can listen to pre-recorded clips of many sounds recorded with this hydrophone in the Soundscape Listening Room, or listen to how fun the live stream from this hydrophone can be in this example. Listen to sounds of Monterey Bay in real time. 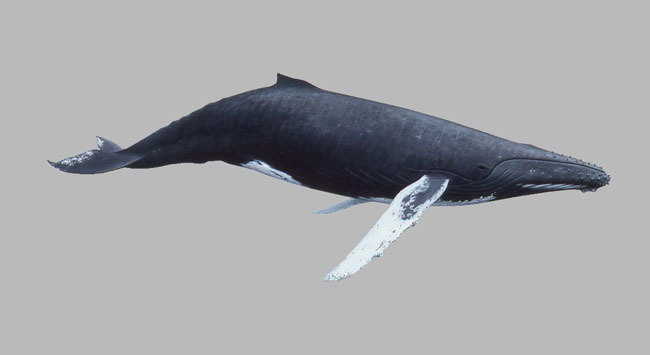 Listen to examples of sounds from marine mammals and Earth. 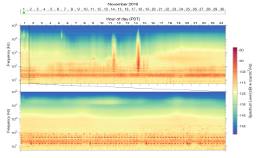 To explore the soundscape visually, view animations of spectrograms (no sound).